Timing Belts should be replaced 50,000 to 90,000 miles (check your owners manual for specifics). It is time to replace the belt if it has any wear on it. We also fix the tensioners, sprockets, and seals. 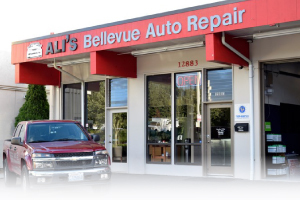 Ali's Bellevue Auto Repair is your locally-owned, family operated repair shop that offers ALL vehicle services and repairs. If it is time to replace your timing belt then give us a call. We offer cost-effective, quality services that will exceed your expectations. Before we do any work Ali's will inspect your timing belt. If it needs to be replaced we can complete that as quickly as possible. Our experienced technicians will inspect and listen to your timing belt. While working on your vehicle if we see anything else that needs repair or fixing we will let you know. If you wait to replace your timing belt and it completely brakes it will cause other damage that can end up costing about 10x the amount of money. A broken timing belt could even lead to a total engine breakdown. You want to get your belt replaced before this happens. Even though replacing a timing belt can be a labor-intensive job it is essential to the continued proper running of your vehicle. 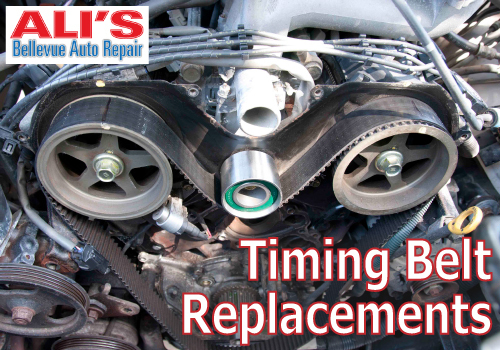 Ali's provides affordable, quality timing belt replacement for Redmond. We have proudly been serving Redmond for decades and will continue to be the place that Redmond residents use and recommend. Give us a call today!